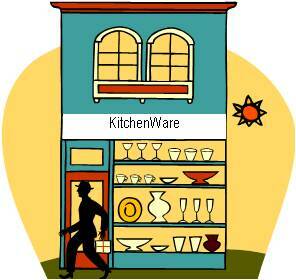 Welcome to the Kitchenware Shop! We're glad you decided to visit us. The Shop has all the utensils and equipment you need to prepare that perfect meal. Need a crock pot for a slow simmer ... you’ll find it here. How about those special tools? Yes, here also. There are several pages of product for you to peruse. For your convenience, you will see on each product who the manufacturer and distributor is so you can be sure you are getting just what you are looking for. Also, there is a good possibility that the same product may appear more than once so you can do a little comparative shopping. So if you are a Foodie, we hope we found your niche. Check back often as we will try to adjust what is on hand based on what you tell us you are looking for. So please feel free to use the Contact Us page and tell us what's missing. The only way to make this the best it can be is with your input. If you are not finding teh exact thing or brand you are looking for, click on the "store" line in one of the blocks below, and it will take you to the home page of that e-store in a new window. From there, they will have a search box where you can put in the details of exactly what you are looking for. As you can imagine, what you find below is but a small sampling of the store's entire inventory. One more thing: Even if you find exactly what you want, you may want to come back to a different store in the boxes below and do the exact same search. This way you will know if you got a good price. If you are a coupon or deal shopper, you will now find the latest deals and coupons from our various partners. The deals/coupons are not just kitchenware shop related, but across the entire inventory of the various stores. In addition, there is a search box that will help you locate a specific deal or coupon for what you are looking for. If a code is needed, click on the box, and it will reveal the code and take you to the store. If no code is needed, simply click on the box, and a new window will open for the store. Not the stuff you are looking for? Looking more for recipe books perhaps? Well you might want to check out the Healthy Cookbook Store, which has a broad range of books across the healthy food spectrum.